Knives, Forks, Scissors, Flames, by Stefan Kiesbye. Pensacola, Florida: Panhandler Books, October 2016. 244 pages. $19.95, paper. “Knives, Forks, Scissors, Flames have no place in children’s games.” This haunting nursery rhyme drips with dread and foreboding, and establishes the tone for Stefan Kiesbye’s novel. Set in a small German village, the book is a shining example of classic Gothic literature, but spun with a modern twist. 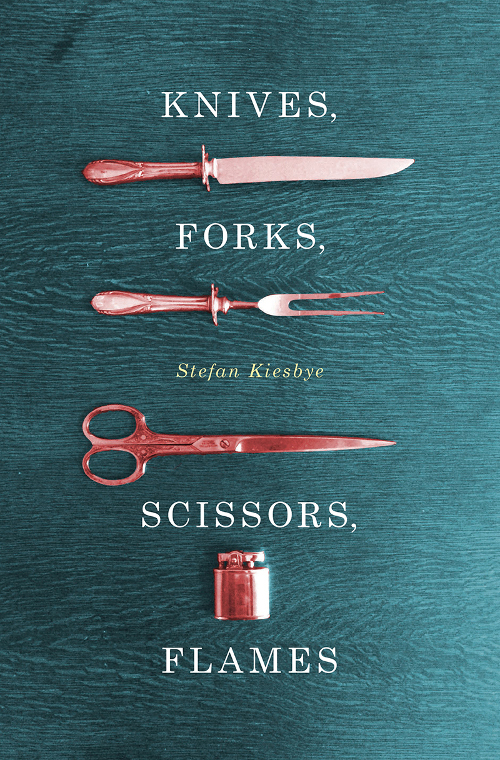 Knives, Forks, Scissors, Flames is indeed a story of discovery styled after detective fiction, but Kiesbye takes us deeper still into the rabbit-hole every page, dangling red herrings along the way, baiting us to suspect each and every character. It all starts with the main character, Benno, a sportswriter from Berlin who moves his family out of the city for the safety of his stepchild, Tim. Tim has a rare skin condition, incurable and baffling to medical practitioners, that allows his skin to heal from cuts and scrapes at an amazing rate. Deemed a “miracle,” the condition begins the scarring process almost immediately, though it could leave Tim horribly disfigured if something sinister were to happen. It is because of this condition that Benno and his small family make their way to the remote village of Strathleven. Unbeknownst to our characters, the farming community has a secret that dates back to the time of Pagan worship and powerful beliefs in Wotan, a deity of similar characteristics to that of the Norse god Odin. Due to the strangeness of the town, and from finding a murdered woman upon arrival, Benno brings himself face-to-face with the village’s dark past. He takes it upon himself to solve the mystery the town, and the townspeople, who are so desperate to hide from the prying eyes of the outside world. But has his prying taken him and his family down a path of no return? Will the solving of this mystery lead to a truth that is better left untold? Can Benno complete this task and come out alive with he and his family intact? The answers to these questions and more are entangled in Kiesbye’s beautiful sentences and wonderful plot twists. While Benno fights for his family and the truth, Tim faces his own struggles adjusting to a new town and trying to fit in to a place that views his condition as something to either be revered or avoided: “A miracle is what it is! The boy was born with a caul!” This piece of dialog from the novel deals with a section when Tim is slashed by two classmates so that they might see his strange condition at work. The mother of one of the boys inspects the wound and claims it is a miraculous feat for Tim’s skin to heal so quickly. People in the town seem to treat Tim differently after this incident is made public, and avoid him or give him gifts without prompting. This attention begins to change Tim as the novel progresses and allows for more family drama. While this fame brings gifts and the wonderment of the town, Tim’s condition attracts unwanted attention that might end up being he and his family’s undoing. Benno now saw shadows flitting across the walls. Light came from outside the church, it seemed to flicker and pulsate, and a terrible howling began. Finally, the choir stopped, the director stepped aside and lowered his head. After that, it was completely silent in the church. The entire congregation held its breath. Tales of ancient rituals hold this truth, scattered throughout the town and held dearly by its residents, who refuse to succumb to change after the Berlin Wall falls. Change is the true adversary of the Strathlevenites. They fight it with everything they can, wanting nothing more than to be left to their own devices. This quality is rendered both sadly and sickly by Kiesbye, sending tingles down our spines. The novel, having been translated from its original German by its author, does not lose anything on us. We instead find a haunting depiction of the culture. Smatterings of the original language throughout make for a thrilling trip across the pond to this country steeped in history and lore. The story, however, will make your skin crawl. Its ending will leave you reeling, your only regret finishing the book too soon. So start back at the beginning. In the novel, there is an openness that makes us wonder if we have not seen the last of Benno. Knives, Forks, Scissors, Flames secures Kiesbye place among the masters of the modern Gothic. Prepare for a reading that will leave you both intrigued and checking around corners for strange figures in the night. C.F. Lindsey is an MA candidate in Fiction at Northern Michigan University. He hails from Arkansas and lives in Marquette with his wife and two dogs.